19 hours, 55 minutes left! Where do I use my Pavers voucher code? Copy your code from NetVoucherCodes and head to the Pavers website. Choose your footwear and click ‘Add to Basket’. Once you’re done shopping click on the ‘Basket’ icon at the top of the website. On the basket page, enter your postcode to calculate shipping costs and press continue to check out. On this page, you’ll see a ‘Gift card or discount code’ box. Paste your code into here and click ‘Apply’ to enjoy instant savings on your order. "Free delivery on orders over £60." "Huge savings available in the clearance section." If you’re looking for comfort, value and style then look no further than Pavers shoes. Your feet deserve the very best and with Pavers excellent selection of women’s footwear you’ll find just that. From casual anatomic sandals or smart work shoes to waterproof leather walking boots, Pavers have it all. Browse their full collection to find your perfect footwear. For men, shoes at Pavers are also the perfect solution. Whether you strive to be the height of fashion, or you simply want a comfortable pair of shoes, Pavers broad selection can offer you the best of both worlds. If you want to look smart look at Pavers ranges of Brogues, or Oxfords. If the casual look is more your thing they have a great range of casuals, loafers, and of course trainers if you're feeling a bit sporty. 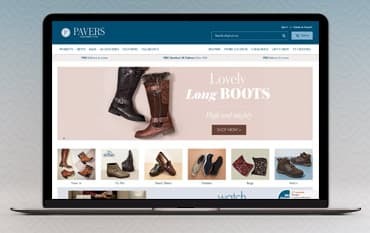 Browse their full collection and find your perfect shoe at Pavers. Sandals at Pavers are sure to brighten up your day with their stunning designs and colours. With a variety of styles, Pavers Sandals are a great way of adding chic to your outfit, making it that extra bit special. Whether you are on the beach or sipping cocktails at a garden party you can do so with some flair. Within Pavers collection there is a full range of casual, daywear, and special occasion sandals that offer comfort, value, and style. Pavers bring you some of the latest designs straight from the fashion houses and some of the most comfortable sandals available. Pavers offer a fantastic range of women’s and men’s boots including flat, knee-high, casual and ankle boots. Boots can be dressed up or down and suit different occasions from work to nights out. The perfect choice for the colder weather, a good pair of boots will keep you warm and comfortable throughout. Women’s boots are amazingly versatile; from different height heels to flats with different width fittings, they suit any style from jeans to dresses. Men’s boots also come in a wide variety, from Chelsea boots to informal desert boots. No matter if it’s men's or women's Pavers boots has comfort, value, and style at their core so there is no shortage of choice. There are several ways to pay: credit and debit card, including MasterCard, Visa, Maestro, Electron and Amercian Express. Or via Paypal, Apple Pay or Amazon Payment. UK Standard Delivery - Free on orders over £60, £2.99 on orders below £60. Express UK Delivery (Next Day) - Order by 4.30pm Monday - Friday £4.99 per order. Return to store for free. Pre-paid return - £2.50 will be deducted from your refund (unless faulty). 99p pre-paid return, paid for at time of order. Your feet take a regular beating as you travel every day, and there's no reason to sacrifice style for comfort with Pavers. Find the perfect shoes for happier feet with Pavers. Their shoes provide great style without compromising on support and comfort. And, with an impressive range of footwear products available, for men and women, you'll find your perfect shoes that satisfy all your needs. Whether you're after boots, sandals, high heels, brogues, smart shoes, causal shoes or trainers, you can find them all in different styles and designs, and, whats more, they're all on offer at affordable prices so you don't need to spend a fortune to find your ideal pair. Bags, socks, accessories and shoe care products are also available when you visit their online retail store.